The Hotel Europa Signa near Florence is a great value for money 4 star budget hotel just 20 mins from the centre of Florence. Offering 116 rooms in a hotel complex comprising two main buildings, this quality and affordable accommodation has modern facilities, state of the art meeting rooms, a large internal restaurant and even an American style bar. The Hotel Europa Signa is therefore perfect for weddings, business functions or holidays with fantastic transport links to Florence and throughout Tuscany. 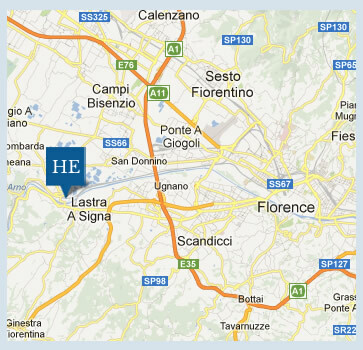 The Hotel Europa Signa Florence is just 20 minutes by train from Florence’s main train station. This means that guests are just moments away from the magnificent renaissance splendour of Florentine architecture and art including the Uffizi gallery, Ponte Vecchio, the Medici chapel, Piazza Signoria and of course the breath-taking cathedral of Florence known as The Duomo. Despite its proximity to the beauty of Florence, the Hotel Europa is also nestled within the stunning Tuscan countryside with other cities of Tuscany also within easy reach. The leaning tower of Pisa is less than 2 hrs away by train and the ancient city of Siena with its stunning cathedral is even closer. The hotel also offers panoramic views of the Tuscan countryside and for those who wish to explore this idyllic paradise, our hotel is also near to the Renai Park which is home to a cycling path that reaches Florence’s Cascine Park along the banks of the River Arno. The park also allows all manner of sports to be played there including horse riding, wind surfing, football, walking, jogging and cycling. To learn more, take a look at our Location page. The Hotel Europa Signa is positioned right next to the train station of Signa and so has fantastic rail links to Florence, Pisa and Siena in addition to the road links and on-site parking. Trains to Siena are every 30 minutes with one change at Empoli with a total journey time of 1 hr 25 minutes. The Hotel Europa Signa Florence is a welcoming 4 star hotel offering 116 clean & comfortable guest rooms and a host of modern facilities. Despite its low cost, the hotel offers a top floor banqueting and conference suite with gorgeous panoramic views of Signa and the surrounding countryside. The hotel restaurant and hotel American bar also provide an excellent place to relax and socialise with facilities easily sufficient to look after wedding parties, business conferences and training courses. Why not take a look at our Photo Gallery or Video Tour pages for a more visual representation of the great value for money facilities available to you, or read more in-depth information by following the menu links above. When satisfied that the Hotel Europa is the perfect hotel for weddings, business functions and people looking for a low cost holiday, then make use of our secure online booking system and receive the best rates guaranteed from this, our official website.